Who is Giovanni de' Bardi? 1. Who is Giovanni de' Bardi? As for the case of Volta, also de' Bardi is a meaningful surname. The Florentine surname Bardi/de' Bardi comes from the very Celtic word Bardus, i.e. bard in English and bardo in Italian, a man who invents and plays music and sings, both a verse-maker and a music composer,... What a meaningful surname for the man, Giovanni de' Bardi, who in the 16th century deliberately decided to found the Modern Opera and the Monody music, in the attempt to revive the ancient forms of Ancient Greek music. The family de' Bardi (or simply Bardi), in Florence since the 10th century AD, was one of the most important and powerful families in Florence. Through their commercial company, the Compagnia de' Bardi, they ran important international banks and also factories for the treatment of wool, wool which usually arrived in Florence from England in great quantities. 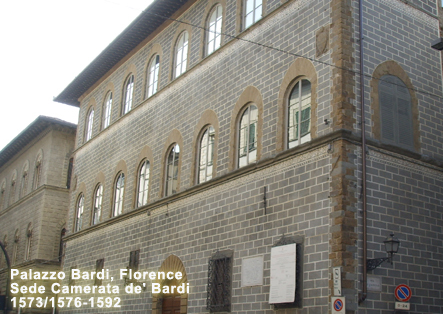 In Florence the Family de' Bardi had 60 Family houses, of which 45 were located in Oltrarno. The city street of origin of their Family was the via de' Bardi (Oltrarno) and their major palaces were Palazzo Canigiani (via de' Bardi nn. 28-30, Florence) and Palazzo Bardi (via Benci n. 5, Florence). In 1810 the main family de' Bardi was extinct and their properties were incorporated in the properties of the famous family Guicciardini (the descendants of famous figures like Francesco Guicciardini; and again nomen omen the family name means Hunting horns). The last surviving member of the Family de' Bardi died in 1964 in Florence as Bardi Serzelli conte di Vernio, who lived in the Family Palace used by Giovanni de' Bardi for his music Camerata in 1576-1592 and who left an important series of pictures to the Uffizi Gallery of Florence. The importance of the Family de' Bardi was not only linked to their activity of major bankers, but also to a fundamental connection with two major figures of the Italian and International Literature: Dante Alighieri and Giovanni Boccaccio. If Dante's Beatrice (the central inspirational character of his books Vita Nova and Divina Commedia) is really Beatrice Portinari, Beatrice (called Bice) got married to Simone de' Bardi (called Mone) as his first wife, when she was ca. 15 years old. As is well known, Beatrice died when she was still young (8 June 1290) and Mone de' Bardi got married to his second wife, Sibilla (called Bilia) Deciaioli. Mone de' Bardi had, at least, three children: Francesca, Bartolo and Gemma. Unfortunately, we do not know if Mone's children were children also of Beatrice (his first wife) or of Sibilla (his second wife). However, the three children of Mone then got married to other members of the major Florence families, the Strozzi and the de' Medici, so that Contessina de' Bardi was the grand-mother of the great Lorenzo de' Medici il Magnifico himself. The father of Giovanni Boccaccio, that Giovanni Boccaccio, author of the Decameron and who, with Francesco Petrarca, opened in Florence the first modern University Course of Ancient Greek (the first European professor of Ancient Greek was Leonzio Pilato, pupil of Barlaam Calabro) and financed the first modern translations of the ancient Greek books and in this way opened the way to the European Humanism and the Renaissance, his father was a major official of the Bank of the Bardi in Naples, responsible for the management of the money of the King of Naples. How this Naples experience in his youth with his father, as bank official of the Bardi at the court of the King of Naples, was crucial to Giovanni Boccaccio's life and to his literary works is well known. Giovanni de' Bardi, was not only a member of the Florentine Aristocracy well trained in both Latin and Ancient Greek and Music Composition, but he was also a well known military commander, who had had an adventurous and tempestuous life in his youth spent in Florence. As a military commander, Giovanni de' Bardi took part in various campaigns in Europe and in the Mediterranean. He fought for the de' Medici against Siena, then he was at the Siege of Malta in 1565 and, once nominated captain, he fought victoriously in Hungary for the Emperor Maximillian II. In order to better achieve his intent, Giovanni de' Bardi studied the historical origin of the ancient football game typical of Florence and so he tracked its origin in the Ancient Greece football games Episkyros (i.e. the Game of the Ball on the Skyros Central Line) and Phaininda (i.e. the Deceiving Game with the Ball) from which the Romans derived their own version of this football game, the Harpastum (i.e. the Game of Carrying the Ball Away). Being Florence an ancient Roman town established by Julius Caesar himself in 59 BC, there was/is a certain real possibility that the Roman game Harpastum just survived in Florence, across the Medieval centuries, as the ancient Florence football game. 5-one team wins by carrying the adversary team/ball beyond the adversaries' own backline. According to the various sources we have, this kind of football game (already used in ancient Sparta, played by two teams of 12/14 men each and with a ball of leather inflated with air and called kenysphaira or follis) was very similar to modern Rugby with the addition of a few characteristics typical of Soccer (and, in general, it was a game even more violent than Rugby and American Football): and this is how Calcio Fiorentino (i.e. Florentine Kick Game) actually works. This kind of game was also praised by Galen in his treatise De parvae pilae exercitio (On the exercise with the small ball), as perfect for the physical exercise of the body. 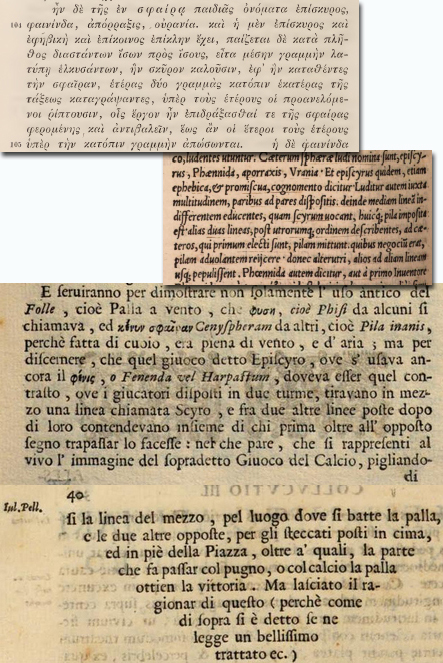 Hence in 1580, following the authority of the ancient lexicographers, antiquarians, physicians and surgeons, Giovanni de' Bardi finally established the fundamental 33 rules of the game of football with his book Discorso sopra il giuoco del Calcio Fiorentino, being the first in history to do so and creating thus a game similar both to Soccer and to Rugby/American Football. Since de' Bardi's football game (Calcio Fiorentino) was the first football game governed by established rules and the Florentine cultural activities always being highly influential across Europe, we understand how the rules defined by de' Bardi worked as a fundamental model and reference for any kind of modern football game. 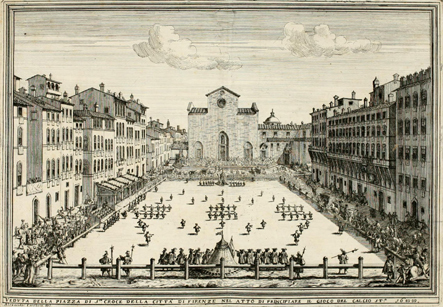 Since de' Bardi, at the beginning, wanted the game to be an elite game for the aristocratic families (a sort of military exercise in the form of a football game, as the Harpastum was for the ancient Romans), families who usually were also in charge of the military activities of Florence, many important historical figures used to play Calcio Fiorentino throughout the centuries, even though it was a very violent, hard and tough game: among them there are three popes (Clemens VII, Leo XI, Urbanus VIII) and many political leaders and men from the Italian major aristocratic families (de' Medici, Gonzaga, Barberini) and even the French princes of Condé (cadets of the House of Bourbon). Giovanni de' Bardi was also well trained in the art of music and his love for the Ancient Greek and Ancient Roman traditions led him to develop the art of music, by reviving the ancient musical forms as described in the ancient manuscripts: a typical behaviour of a man of the Renaissance, who cultivated the love for the Ancient texts and traditions, like the truest Humanist, inspired by the Florentine Petrarca's and Boccaccio's first activities in this field (see supra). 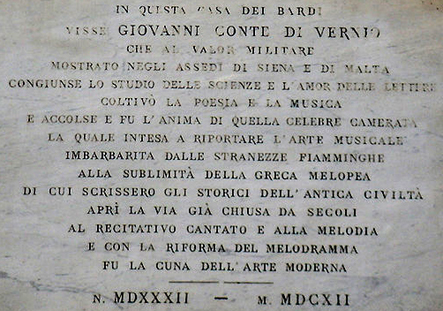 Thus Giovanni de' Bardi, in a period between 1576 and 1592, started a series of musical activities carried on by a group of people who usually kept their sessions of cultural discussions and of music playing at de' Bardi's own palace in Florence, Palazzo Bardi (via de' Benci n. 5, Florence). This group received the name of Camerata de' Bardi or Florentine Camerata. It was made up by composers, music theorists and scholars and was led by Giovanni de' Bardi himself (the patron and host), who was also a music composer (unfortunately most of his music works went lost and are still lost). 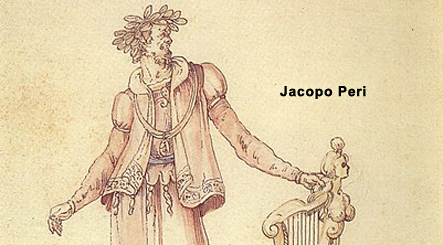 In this way, the two rival groups led Jacopo Corsi himself, Jacopo Corsi's composer, Jacopo Peri, and de' Bardi's poet Ottavio Rinuccini to collaborate in creating the first opera ever written Dafne (unfortunately a work still lost: there are just a few fragments left of this opera composed both by Jacopo Corsi and by Jacopo Peri) in 1597/1598 (premiere probably 26 December 1598, Palazzo Tornabuoni, Florence, the palace of Jacopo Corsi). Two years later the collaboration of the two composers Jacopo Peri (patron Jacopo Corsi) and Giulio Caccini (patron Giovanni de' Bardi) with de' Bardi's poet Rinuccini led to the premiere of the second opera in history and the earliest still surviving opera, Euridice (premiere 6 October 1600, Palazzo Pitti, Florence). To create the melodramma/opera the Camerata de' Bardi had to develop the technique of the monody and did this, by following the instructions of the Ancient Greece philosophers and theorists. 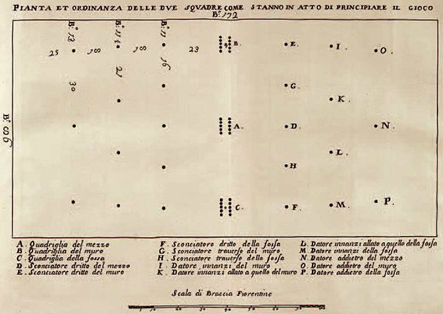 Therefore monody started acquiring a position of contrast to the traditional polyphony style of that period, a polyphony style perceived as highly complicated (up to the obscurity), a corrupt and twisted form of music, incapable of conveying real emotional effects to an audience (nonetheless, as far as we know, it seems that both de' Bardi and Caccini, in the end, thought that that counterposition of the two styles had not to be so completely radical). Moreover the ideas of simplicity and of perspicuity which were cultivated with the monody style (that's to say a canto and an accompanied basso with some chordal harmony, leading, in the end, to a recitativo, arioso and aria style) created a sort of dilemma, which had a great highly influential role in the history of music: monody vs. polyphony or harmony vs. counterpoint or homophonic-melodic treatment vs. contrapuntal treatment, as Schoenberg put it? If we comprehend this passage well, we'll better understand why the aesthetic ideas behind major composers like Paisiello found music perspicuity a fundamental aspect of the work of a music composer and which theoretical ideas led Gluck to carry on a reform of opera which had to change the structure of opera itself into a sort of simplified (also musically speaking) aboriginal purity. How Wagner developed such ideas, also from Gluck, into his form of opera/theatre (recitar cantando) is well known. And we comprehend also why composers like Haydn and Mozart, following the ideas of C.P.E Bach, cultivated and developed forms of music, which were fundamentally and theoretically an amazing, marvellous and highly developed combination of the two techniques, the homophonic technique and the contrapuntal one, and why a certain acrimony emerged in Vienna between the Haydn-Mozart group of people and the Gluck group of people (among them Gluck's pupil and official successor Salieri) with those many various accusations carried against Mozart and his opera writing: too many notes, lack of respect for word, German rubbish, due to its open contrast to the Italian and Gluckian simplified purity. Giovanni de' Bardi at IMSLP.